and have made the LORD their hope and confidence. with roots that reach deep into the water. or worried by long months of drought. and they never stop producing fruit. What does it look like to “trust in the Lord”? What does it mean to make him your “hope and confidence”? I’ve been wrestling with those questions over the past couple days – ever since my Dad reminded me of Jeremiah’s words. Part of the answer lies in the alternative: trusting in “mere humans” and relying on human strength. Do that, Jer’ says, and you’re cursed. Not necessarily damned, but certainly doomed. Like a “stunted shrub in the desert… in the barren wilderness, in an uninhabited salty land.” With “no hope for the future.” Dismal words. Dismal picture. Dismal life. Look at the picture above. The landscape looks pretty brown and barren. Lots of weeds, but no crops. But the tree is flourishing. Green, leafy, healthy. Why? Because down to the right of the trunk, below the canopy’s shade, is a river. Not much of a river here, but water, nonetheless. And the tree’s roots reach through the brown soil deep into the ground where the water sits. 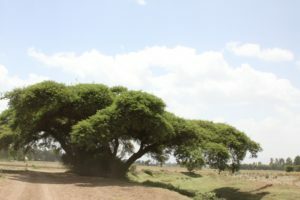 This particular tree, a few miles west of Ethiopia’s capital city, is a prayer tree. Christians from nearby villages meet here to pray in its cooling shade. In the midst of a dry and weary land, they come together to put their trust in the Lord; to make him their hope and confidence. And they—like the tree—aren’t afraid of the drought, but stay green and fruitful. I’ve been through some wilderness times. I feel like I’m in the wilderness now. But there’s something different this time. More than ever before, I know I can trust in God. I know he is worthy of my trust, hope, confidence. It’s not easy; I’d really like to be able to just move forward, to pop out one more resume and get the job I’ve been waiting for, to be done with the waiting and wondering and wandering. But he’s faithful. And even when I can’t see it, he’s growing fruit in me…and maybe even through me. And I don’t have to fear the drought. This entry was posted in disciple, faith, peace, quiet, Uncategorized and tagged drought, tree, trust, water on February 22, 2017 by Randy Ehle.